Claude Monet (1840–1926), La Promenade (Woman with a Parasol, Madame Monet and Her Son) (1875), oil on canvas, 100 × 81 cm, National Gallery of Art, Washington, DC. Wikimedia Commons. The umbrella may now be most often used to shelter from rain, but historically its most sustained purpose has been to shelter from sun. Yesterday’s modest collection of paintings of umbrellas in the rain reflects the difficulty of making good paintings of wet conditions. It follows, then, that there are many more paintings showing umbrellas and parasols being used in fine and dry weather. In complete contrast to the story of the umbrella in rain, its use in the fair weather of Europe has become a matter of fashion, as an accessory almost exclusively to shade women. I will here ignore its specialist applications in plein air painting and fishing. Girolamo dai Libri (1474–1555), Umbrella Madonna (Enthroned with Jesus between St. Joseph – St. Raphael the Archangel and Tobias-Tobia) (1530), media and dimensions not known, Museo di Castelvecchio, Verona, Italy. Wikimedia Commons. 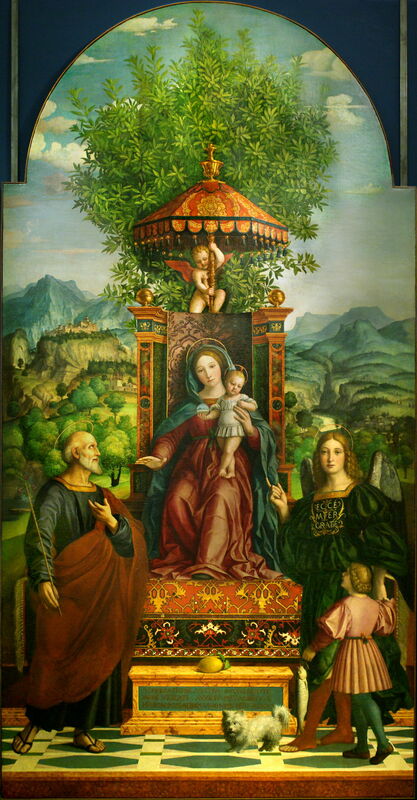 Girolamo dai Libri’s Umbrella Madonna, or more prosaically titled Madonna Enthroned with Jesus between St. Joseph, St. Raphael the Archangel and Tobias from 1530, shows an intermediate step between the ecclesiastical umbraculum and an ornate parasol. The winged putto supporting the umbrella seems to be skewering it into the top of the Virgin’s throne, and Raphael the Archangel is wearing an ancient precursor of the modern printed T-shirt. Anthony van Dyck (1599–1641), Portrait of Elena Grimaldi (c 1623), oil on canvas, 246 × 173 cm, National Gallery of Art, Washington, DC. Wikimedia Commons. 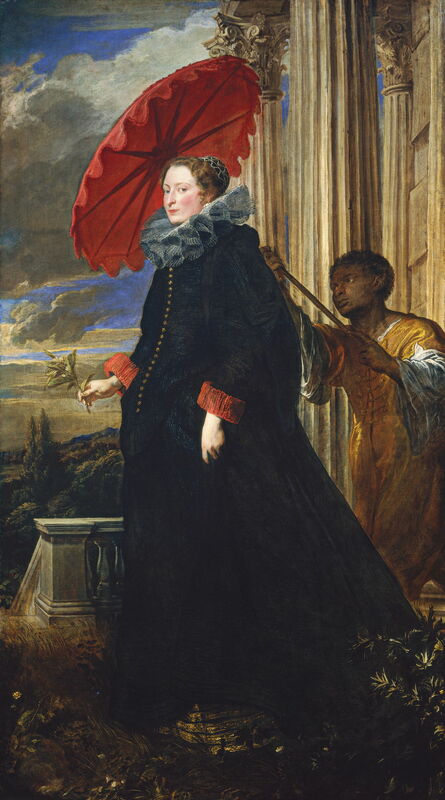 Umbrellas and parasols were adopted by many women of the nobility, as shown in Anthony van Dyck’s Portrait of Marchesa Elena Grimaldi Cattaneo from about 1623. The Marchesa was a Genoese aristocrat, whose appearance and deportment reinforce her status, from her matching scarlet cuffs to the gold braid around the lower edge of her underskirt. Eugène Boudin (1824–1898), The Beach (1864), oil on panel, 42 x 59 cm, Art Gallery of New South Wales, Sydney. Wikimedia Commons. When people started to gather on the beaches of Europe, it was only natural that the ladies should take their parasols with them. 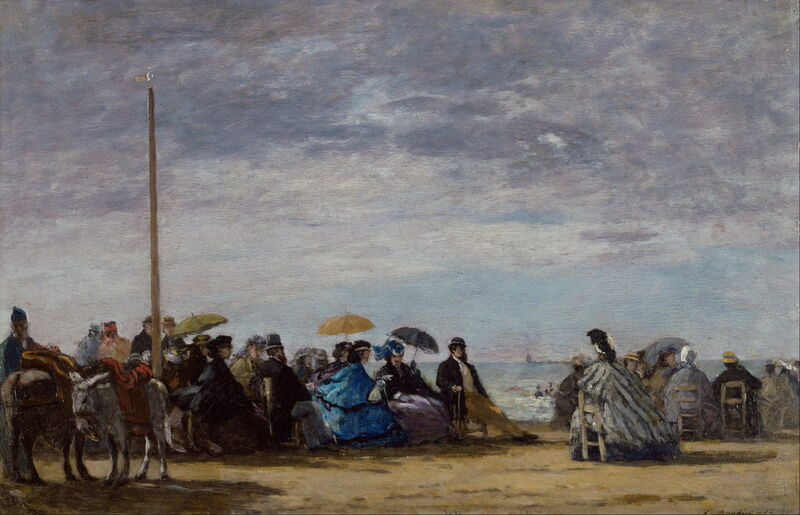 Eugène Boudin’s marvellous paintings of these incongruous soirées show participants seated on upright chairs, wearing heavy outdoor clothing, their parasols superfluous under the overcast sky at dusk – here in The Beach from 1864. Claude Monet (1840-1926), The Beach at Trouville (1870), oil on canvas, 38 x 46.5 cm, The National Gallery (Bought, Courtauld Fund, 1924), London. Image courtesy of and © The National Gallery. 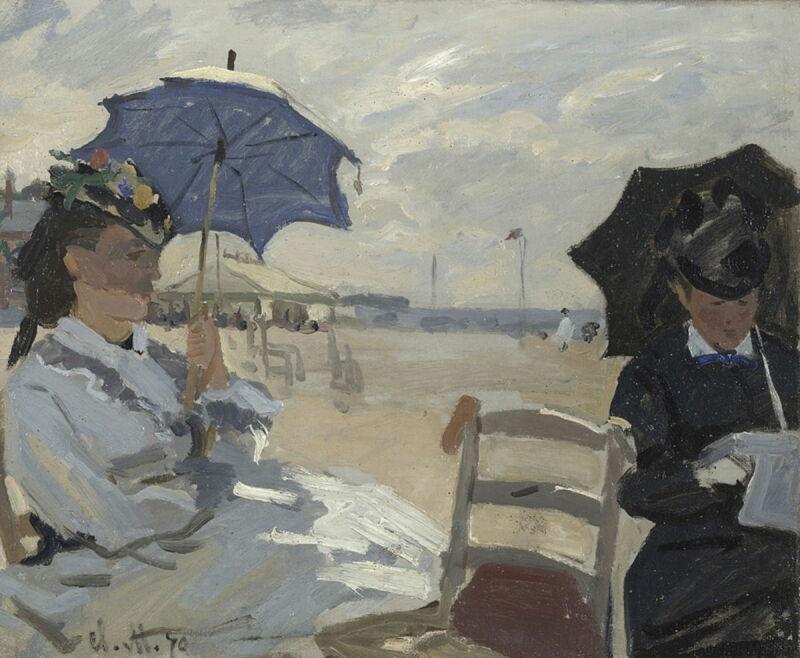 When Claude Monet’s family and friends took to The Beach at Trouville in 1870, they too brought their parasols. The woman on the left is thought to be Monet’s first wife Camille, and that at the right is probably Eugène Boudin’s wife. This was painted during the Monets’ honeymoon. It also marks an interesting period of transition: Madame Boudin wears black and holds a black parasol, similar to those seen in her husband’s earlier beach scenes. 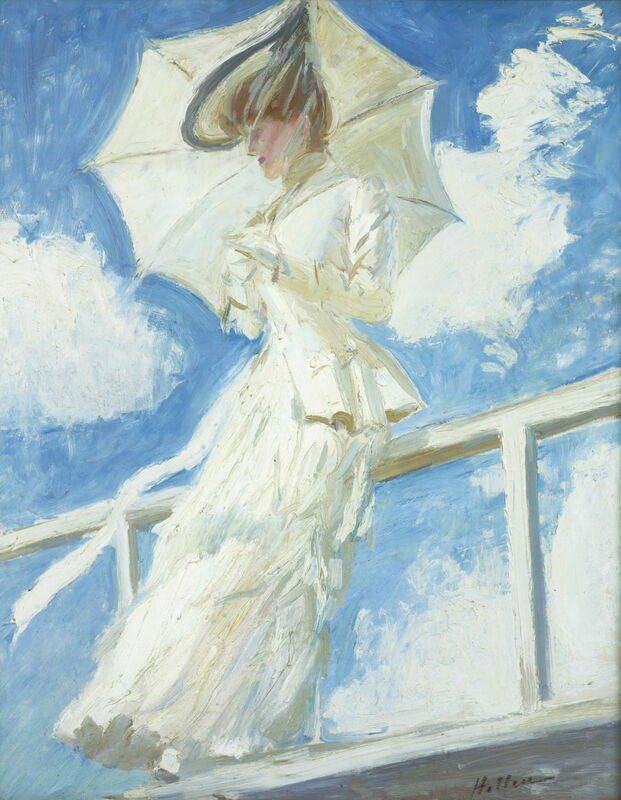 Camille Monet wears white and holds a white parasol, attributes of the younger generation. Jules Breton (1827–1906), Élodie with a Sunshade, Baie de Douarnenez (1871), oil on canvas, 65 × 90.8 cm, Private collection. Wikimedia Commons. The following year, Jules Breton and his family spent much of the summer and autumn in their customary haunts in Brittany. 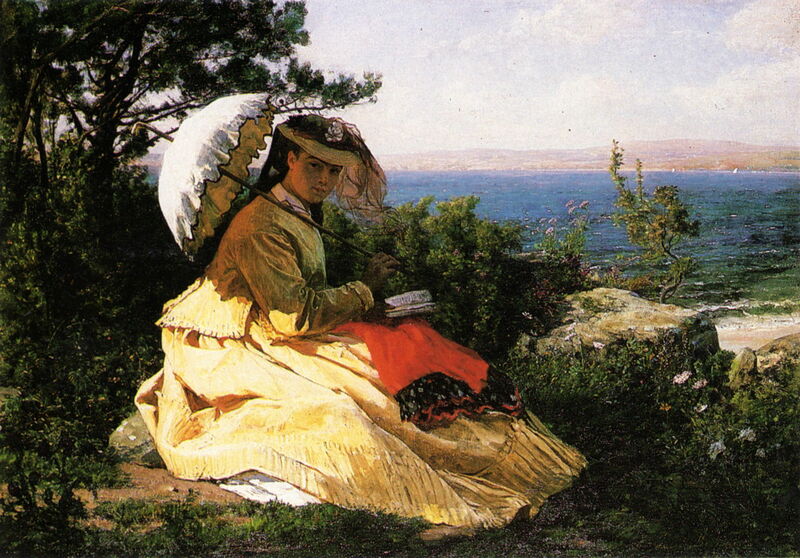 Breton there painted his wife Élodie with a Sunshade, Baie de Douarnenez (1871), with its magnificent view over that bay to the low hill of Ménez-Hom in the far distance. Although Breton was closer to Boudin’s generation than that of Monet, his wife opted for a more modern look than that of Madame Boudin. 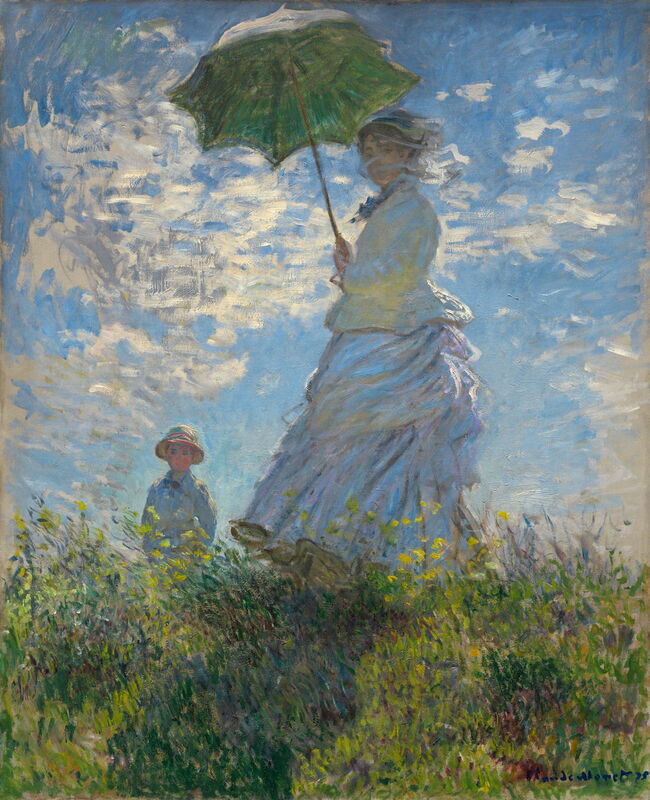 Camille Monet appears again in fashionable white, with a white parasol, in Monet’s La Promenade, or Woman with a Parasol, from 1875. Édouard Manet (1832–1883), Spring (Jeanne Demarsy) (1881), oil on canvas, 74 x 51.5 cm, J. Paul Getty Museum, Los Angeles, CA. Wikimedia Commons. 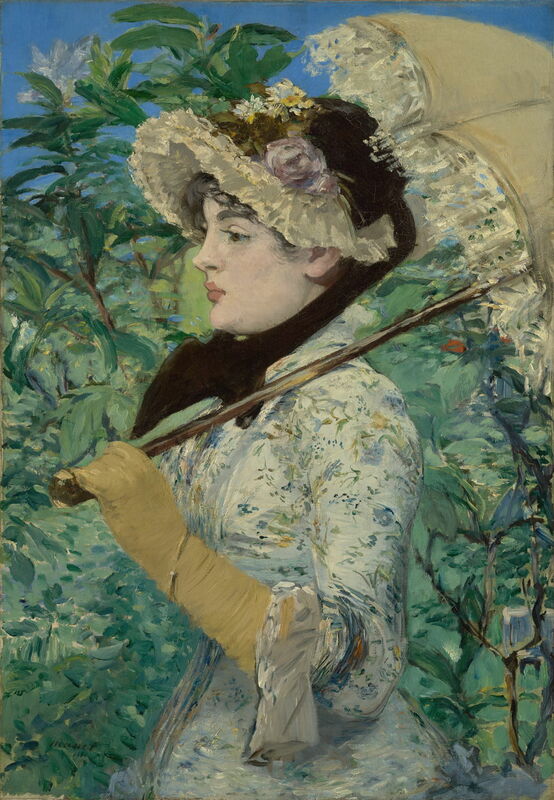 Édouard Manet’s portrait of Jeanne Demarsy in his Spring from 1881 shows this actress who lived from 1865-1937, and modelled for both Manet and Renoir. At the age of just sixteen, and here still aspiring to the stage, she wouldn’t have been seen dead with an old black parasol. So far, these parasols and umbrellas have declared their roots in the umbraculum, with their lacy trimmings and plain fabrics. In the 1880s, a new fashion took Paris and the rest of Europe by storm: Japonisme. Olga Boznańska (1865–1940), Portrait of a Young Woman with a Red Umbrella (Portrait of the Artist’s Sister with a Red Umbrella) (1888), oil on canvas, 88 × 60 cm, Private collection. Wikimedia Commons. 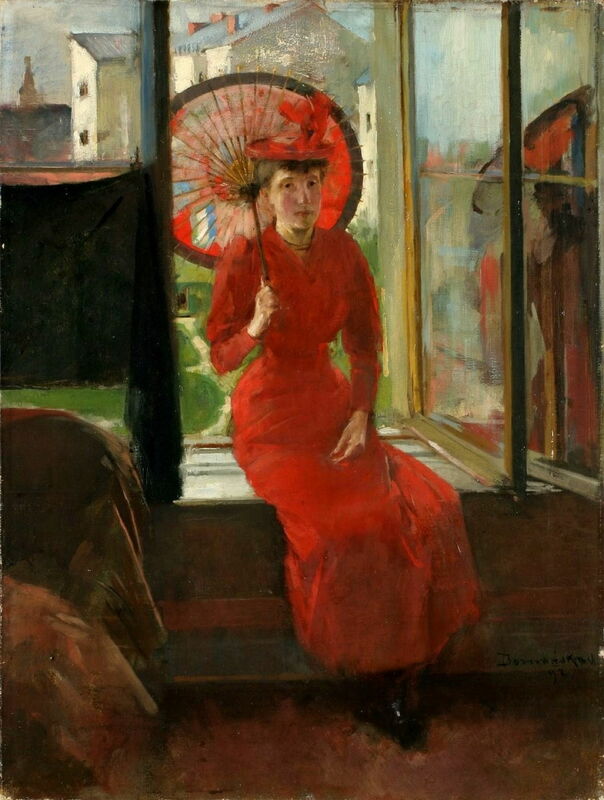 In 1888, Olga Boznańska painted her sister in this Portrait of a Young Woman with a Red Umbrella, holding a brightly decorated east Asian parasol complete with its bamboo ribs. John Singer Sargent, Morning Walk (1888), oil on canvas, 67.3 x 50.2 cm, Private collection. WikiArt. 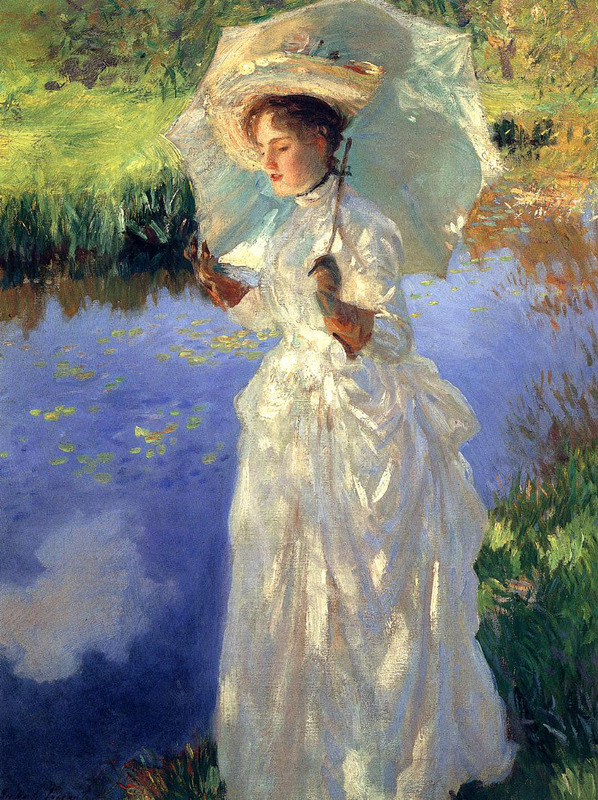 John Singer Sargent’s model for his painting of her Morning Walk (1888) remained more conventional, though, and Sargent himself was never really smitten by Japonisme, despite the subtle references in his Carnation, Lily, Lily, Rose of 1885-86. Olga Boznańska (1865–1940), Self-portrait (1892), oil on cardboard, 65 × 52 cm, Muzeum Narodowe we Wrocławiu, Wrocław, Poland. Wikimedia Commons. 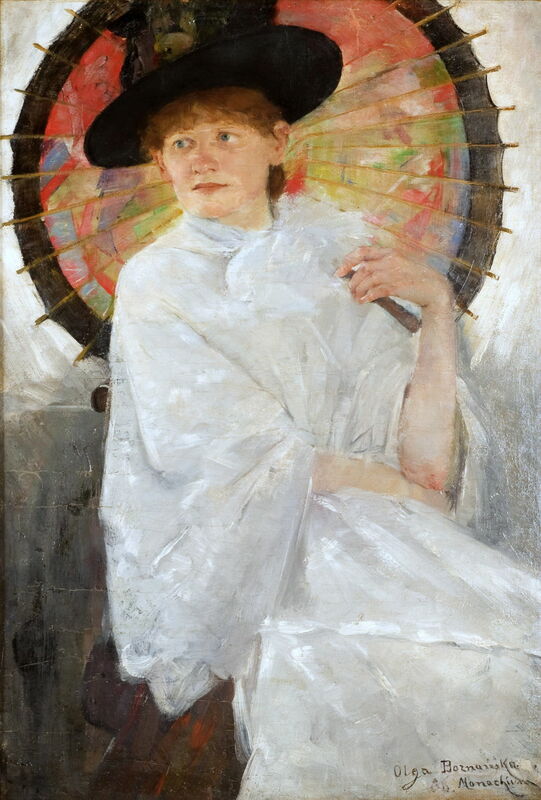 A few years later, in 1892, Olga Boznańska painted this ingenious Self-portrait with a Japanese umbrella. Victor Gabriel Gilbert (1847-1933), Loving Flower Care (date not known), oil on canvas, 40.5 x 32.5 cm, location not known. Wikimedia Commons. 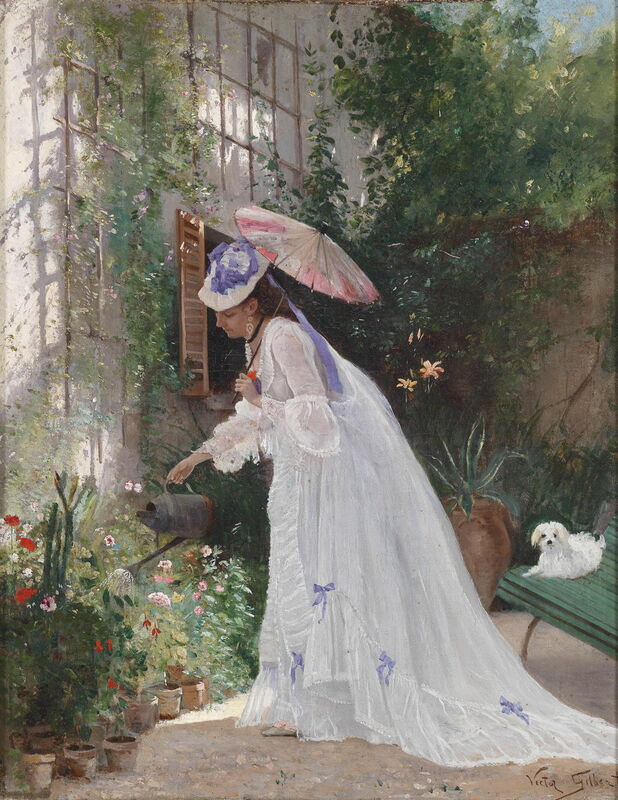 Victor Gabriel Gilbert’s undated Loving Flower Care was most probably painted at around this time, and features another Japanese parasol with more subtle colours than those of Boznańska. His model is hardly dressed for the task of gardening, though! Paul César Helleu (1859–1927), Portrait of Mrs Helleu with an Umbrella (1899), oil on canvas, 81 × 65 cm, Private collection. Wikimedia Commons. Paul Helleu’s wife Alice was his favourite model, and features in his very loose oil sketch in blue and white of Portrait of Mrs Helleu with an Umbrella (1899). 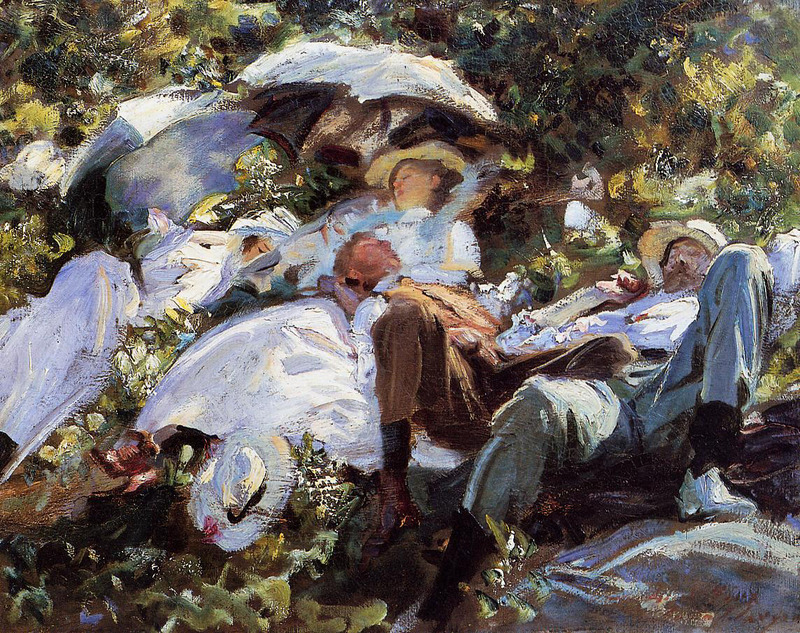 John Singer Sargent (1856-1925), Group with Parasols (A Siesta) (c 1905), oil on canvas, 55.2 x 70.8 cm, Private collection. WikiArt. Several of the many sketches made by John Singer Sargent of his friends during their travels in the Alps and elsewhere include their white parasols, as in this Group with Parasols (A Siesta) from about 1905. Paul César Helleu (1859–1927), On the Beach (1908), oil on canvas, dimensions not known, Private collection. The Athenaeum. In Helleu’s panoramic view On the Beach from 1908, his model’s parasol reclines on its own, apparently deployed as a compositional device. Joaquín Sorolla (1863–1923), Strolling along the Seashore (1909), oil on canvas, dimensions not known, Museo Sorolla, Madrid, Spain. Wikimedia Commons. 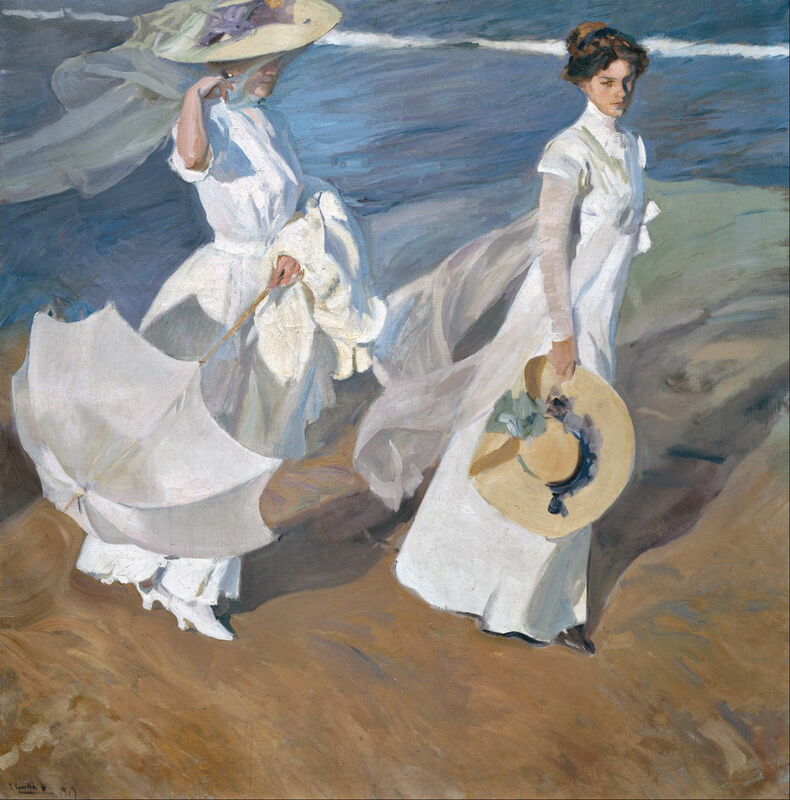 Joaquín Sorolla, another of the virtuoso painters alongside Sargent at the turn of the twentieth century, shows the white parasol as part of full dress for a formal promenade of the beach at Valencia, Spain, in his Strolling along the Seashore (1909). William Orpen (1878–1931), Midday on the Beach (1910), oil on canvas, dimensions not known, Private collection. Image by Rlbberlin, via Wikimedia Commons. 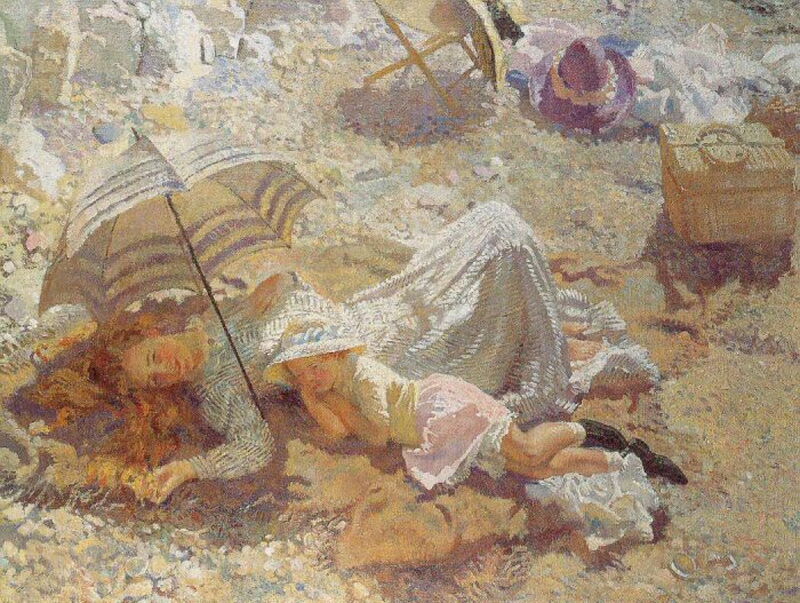 William Orpen’s Midday on the Beach (1910) shows a British day out before the First World War, with lighter dress, parasols, and a large wicker hamper containing a packed lunch. John Singer Sargent (1856-1925), Simplon Pass. The Tease (1911), watercolour on paper, 40 x 52.4 cm, Museum of Fine Arts, Boston. WikiArt. 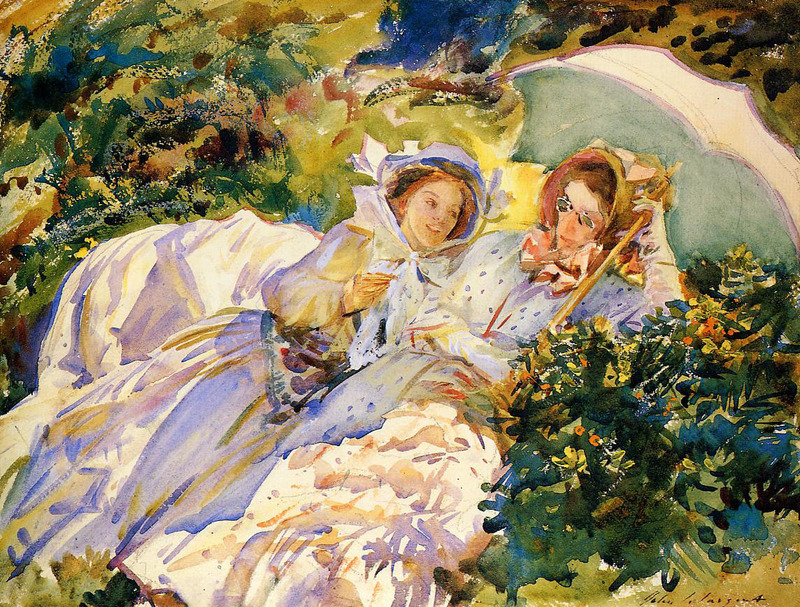 When crossing the Simplon Pass through the Alps, in The Tease (1911), Sargent’s friends still travelled in their voluminous dresses, hats, with a white parasol. Louise Upton Brumback (1867-1929), Good Harbor Beach (1915), oil on canvas, 59.7 x 70 cm, Private collection. Wikimedia Commons. 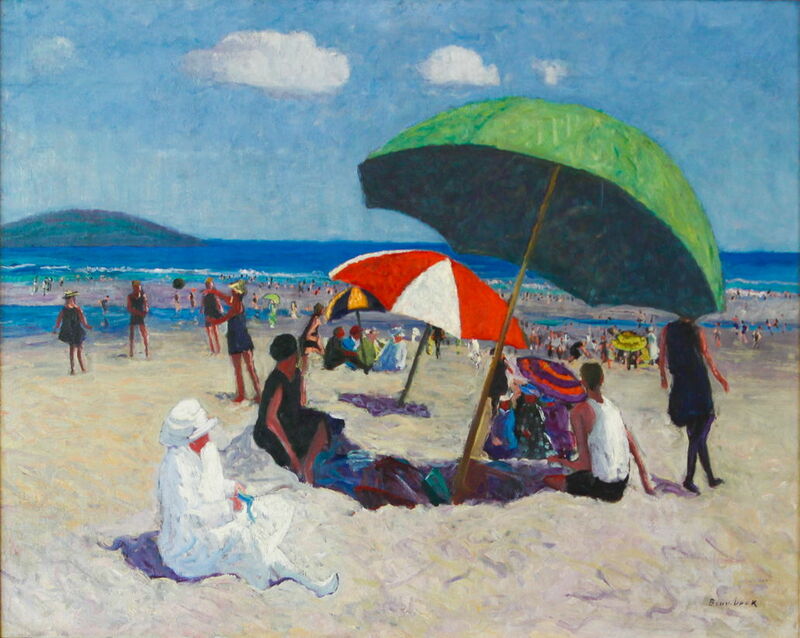 Meanwhile, down at the coast on Good Harbor Beach (1915) in Gloucester, MA, large brightly-coloured beach umbrellas had become a feature of a more modern beach scene, as painted by Louise Upton Brumback in her bold and crisp style. 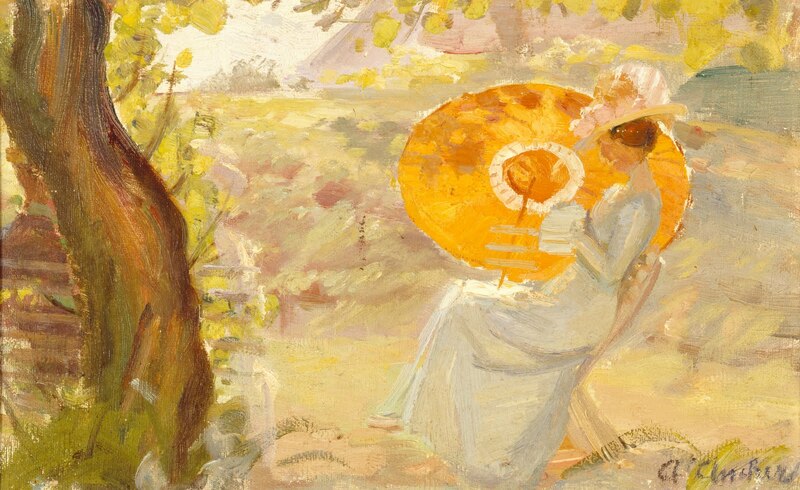 Anna Ancher, Young Woman in the Garden with an Orange Parasol (after 1915), oil on canvas, 31.8 x 20 cm, BRANDTS Museum for Art & Visual Culture, Denmark. Wikimedia Commons. Japonisme was not dead yet, though. Painted after 1915, Anna Ancher’s Young Woman in the Garden with an Orange Parasol shows an umbrella at least inspired by east Asian style, and once again bright in its colours. Colin Campbell Cooper (1856–1937), Summer (1918), oil on canvas, 127 x 153 cm, Private collection. Wikimedia Commons. My final example was painted in 1918, at the end of the First World War, far from the mud and blood of Europe’s battlefields. 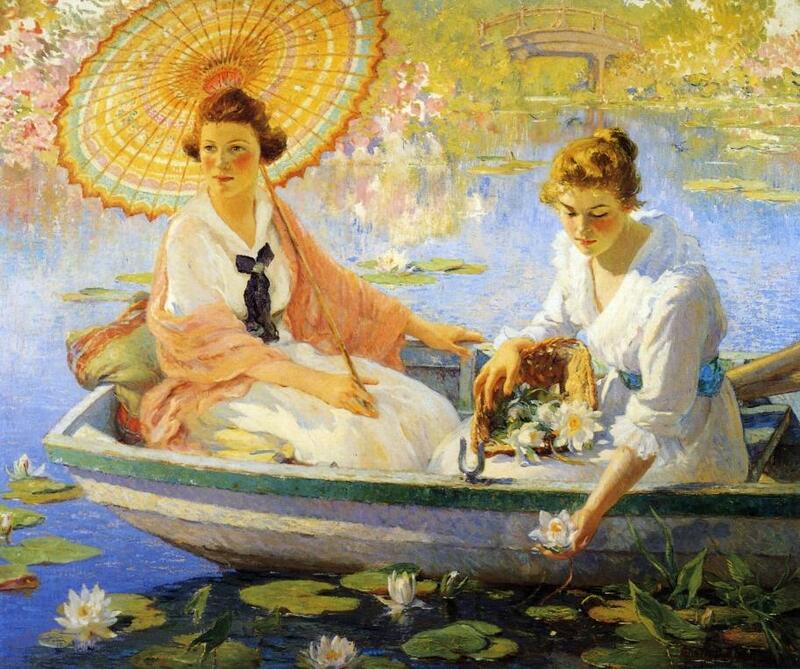 Colin Campbell Cooper’s Summer (1918) is inspired by Japonisme, fortified here by the east Asian influence of California, and by Monet’s paintings of his garden at Giverny. One accessory with two contrasting purposes and histories, the umbrella lives on in the hands of many. Posted in General, Life, Painting and tagged Ancher, Boudin, Boznańska, Breton, Brumback, Cooper, dai Libri, Gilbert, Helleu, Manet, Monet, Orpen, painting, Sargent, Sorolla, van Dyck. Bookmark the permalink.